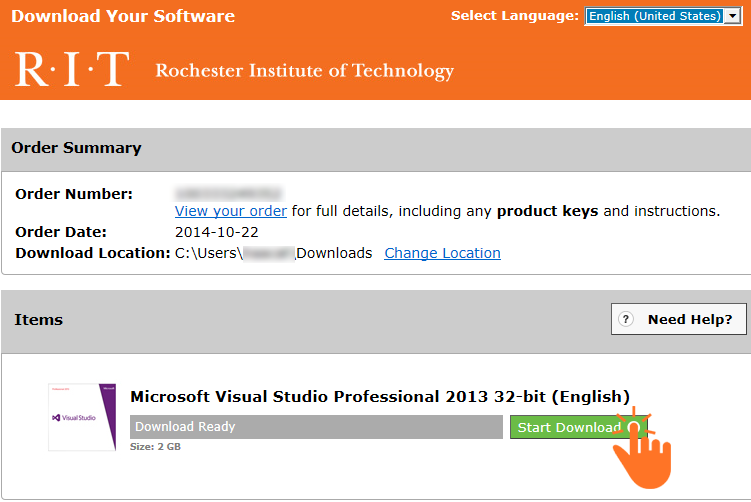 RIT Faculty and Staff are eligible to purchase home use licenses of certain Microsoft and Adobe software. 2. After selecting a software to purchase, you can select which edition of that software available to purchase. 4. (Optional) Read the system requirements before adding the software to your shopping cart to ensure its compatibility with your system. 5. Click on the "Check Out" button once you are done. 6. Software Subscription Agreement. Click "I Accept" to be able to proceed. 7. Payment and contact information. 9. Receipt and Product Key. 1. Download and install the SDM from the prompt screen (skip this if already has the SDM installed on your system). 2. Download and install the SDX file from the prompt screen. Once downloaded, open this file using the SDM to be able to download the software. 3. Start downloading the purchashed software as seen below. 4. Once the download is completed, launch the installer as seen below. Questions? For additional assistance, please contact ITS ResNet.